Whether you’re heading to Amazon.com or your grandma’s grooming blog, every website and application on the internet is supposed to be delivered to you at the same speed. Under the current rules, internet service providers, or ISPs — companies like AT&T, Verizon and Comcast that control the delivery pipes of your broadband or wireless connections — are required to treat every site equally and give consumers the same access to all content. They can’t discriminate by blocking or slowing down the loading speeds of certain sites or creating “fast lanes” for other sites that pay extra to appear reach your screen faster. It’s a system known as net neutrality, one that the internet has long operated under and that the government began official enforcing in 2015. That’s when the Federal Communications Commission — the 5-member bipartisan agency that monitors radio, television, phone, satellite and cable services — voted to implement new internet regulations meant to preserve the web as a relatively equal playing field for consumers and website owners. The vote reclassified wireless and broadband internet providers as “common carriers,” a designation that gives the FCC the authority to regulate the industry like a public utility, in much the same way that that government regulates water and power companies. But, as with so many things under the Trump administration, that’s all subject to dramatic change. New FCC chairman Ajit Pai, a Republican appointed by Trump in January, is hell-bent on scrapping the net neutrality regulations. His proposal to dismantle the current rules is up for a vote on Dec. 14. and is all but guaranteed to pass the Republican-controlled agency. The reversal would strip the government of its power to regulate ISPs and their conduct, giving those companies more control over how they deliver specific content to their customers. Although this all sounds like a big yawn fest, the upcoming vote is actually a pretty big deal, especially if you happen to use the internet for, well, just about anything (like reading this blog — which I hope loaded quickly). “The economics are simple here. The more heavily you regulate something, the less of it you’re going to get” said Pai, who previously worked for Verizon. He argues the current rules are unnecessary government overreach that prevent companies from expanding their broadband services and offering customers more service plans to choose from. ISPs, he added, adhered to the basic principles of net neutrality long before the government stepped in. His proposal would require ISPs to let consumers know if they permit content blocking or limit how fast certain sites load (known as bandwidth “throttling”). The new rules could into effect as early as January, although a court challenge is likely. 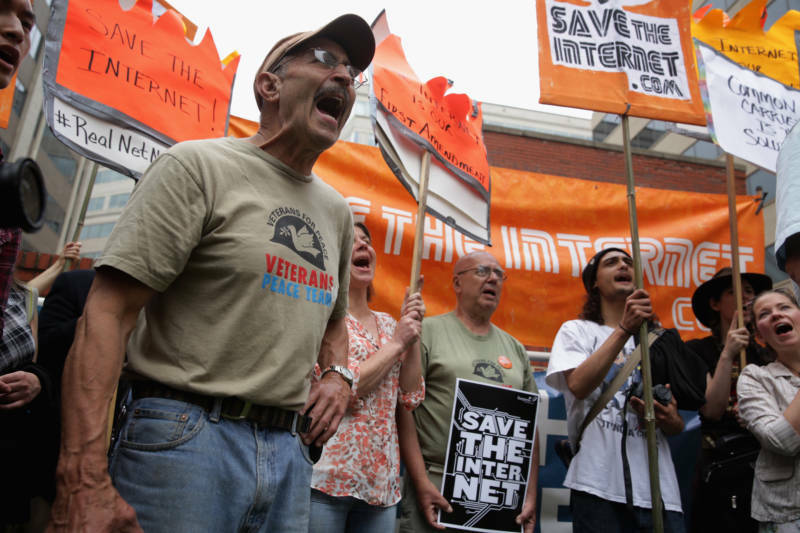 The upcoming FCC vote has set off a fight over free speech and the control of the internet. It pits internet giants like Google, Amazon and Facebook against telecom titans like AT&T and Verizon, which have fought for years against broadband regulations. Defenders of net neutrality argue that it’s essential for innovation, giving start-ups and small companies a fighting chance and protecting the diversity of services available to users. Its absence, they argue, would inevitably create a pay-to-play outcome, allowing telecom companies to be powerful gatekeepers to information and entertainment. “Without those protections, ISPs can abuse their position as gatekeepers to the broader Internet to further cement their monopolies, hurting Internet users, content providers, nonprofits and small businesses in the process,” the non-profit Electronic Frontier Foundation wrote in a statement. Consumer advocates have also voiced concern that the change could lead to higher consumer prices for existing internet access and speeds – a charge the big ISPs dispute. Prev Were the Pilgrims America’s Original Refugees? Next Integrating Current Events with KQED's "The Lowdown"